Hey ya, I am back after a rejuvenating summer break. Lots of traveling, family gatherings all punctuated by food now and then. Slipping back into routine can be overwhelming and sometimes depressing but its always good to be back home, reconnect with friends and to your own work space, your own home office. 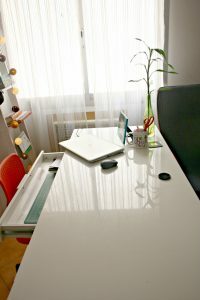 Speaking of work space, this post is picture heavy as I share lots of tips with pictures to setup your own home office and that too on a budget. Working from home can be challenging in so many ways, not only you need self motivation, discipline, schedule but also a space. It can be just a chair in a corner of your house but it should be a dedicated one. 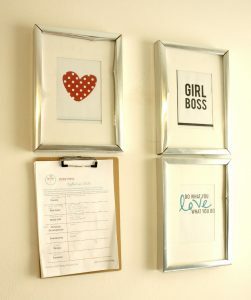 Lot of things have been said about working from home and you can find tons of articles but in my humble opinion this is a great option if you are a young mom (or a mom of young kids 😉 , your potential workplace involves lot of commuting or your work is freelance/self employed/ entrepreneurial sort. 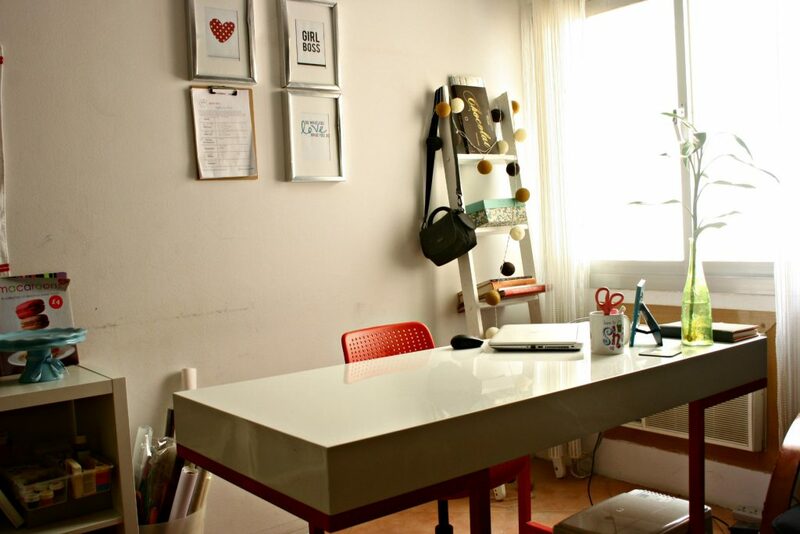 Whether its serious office kind of work or creative, you should be having a space for the said task. It just gets you into mood and boosts productivity. With the advent of internet and communication channels, work from home has become quite trendy. I have been wanting to setup a corner for myself for the longest time but somehow besides a desk and chair, I had stuff all over the place. My baking and cake decorating books were in the kitchen while my cake decorating tools were in a living room shelf. My laptop was in my bedroom moving around as necessary while all the thoughtful adorable stuff I was gifted were packed inside a cupboard. 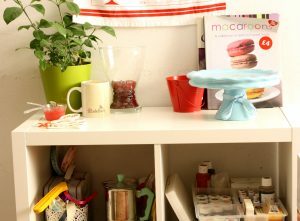 I wanted to combine everything so I have only two places, kitchen with related equipment like mixer, pans, oven, ingredients for baking and office (I like to call it creative studio because that is what it is) for my blogging, cake decorating and photography as well as occasional teaching. 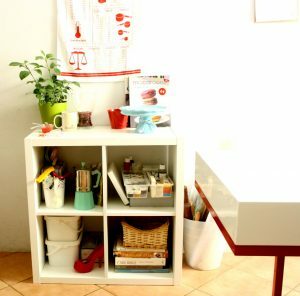 Space – Find a space/corner that works for you. You don’t have to change house, construct anything, just allocate a dedicated area no matter how small. 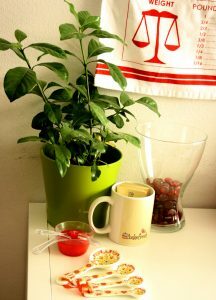 I love my desk by the window which throws ample light to brighten up everything including my mood. Budget – Set a budget or atleast mental notes on how much you want to spend, ofcourse sky is the limit but if you are from entrepreneurial mindset or aspiring to be one, I am sure you won’t be spending too much. Look around in local stores, what matches your style, need and budget? Luckily (ok a little too much), I got this table for free in one of the promotions at local furniture store when we bought something else. I could’nt ask for more. Furniture – Do you sew? or knit? or work on computer? or paint? The furniture you pickup is your next step. 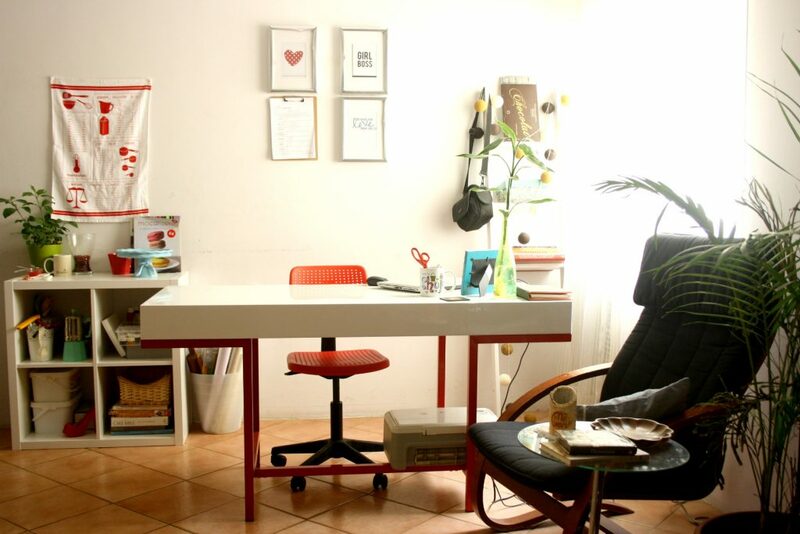 Not only it should fit in the selected space but also suits the nature of work you do majorly. For knitting, may be a comfortable chair and small table is sufficient, for sewing, a table for machine and couple of drawers and so on. I have added a reading corner too with a huge palm plant for that mind grilling sessions. Storage – What kind of storage do you need and how big or small. 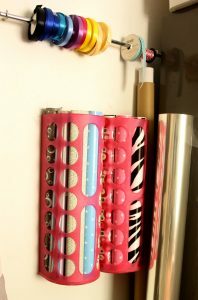 For me it was books, cake decorating tools, fondant storing racks, decorative paper rolls, ribbons to name a few. Ikea found in most of the countries is my favorite to shop for such nifty storage. I got a solid white cube shaped open shelf with four sections which sufficed. From previous purchases I had a super simple multi color six drawers plus four racks movable trolley. 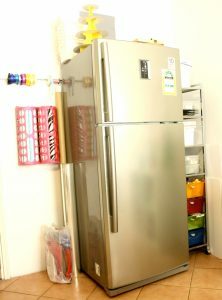 In case you are wondering, this refrigerator is part of my setup and is a dedicated storage for all my desserts, cakes and baking ingredients. Accents – While you may want your major pieces in neutral so you can up or down play them with various accessories, adding accents is the most fun and personalized way to put a look together. 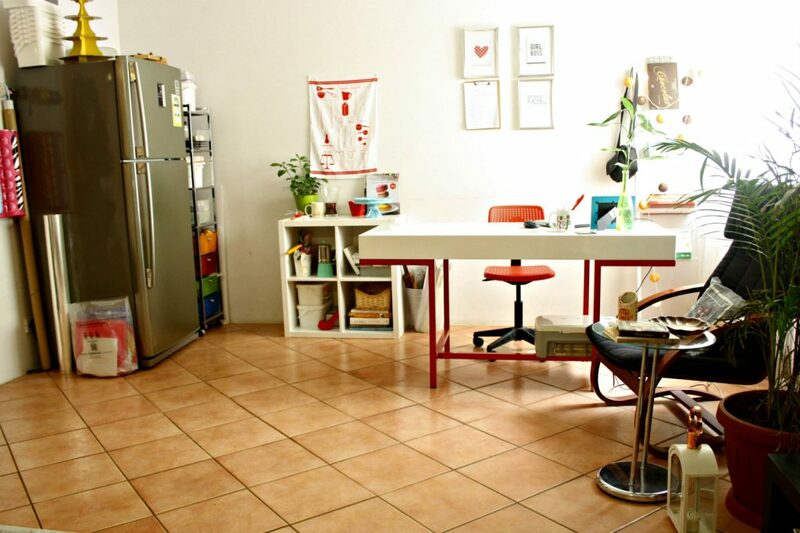 Pinterest can be your inspiration while the existing things you have can add lot of character. 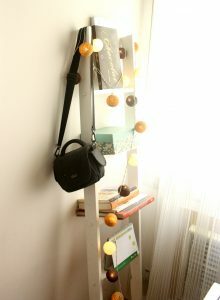 You can see that I have used a ladder from kids bunk bed (which we disassembled) and used it as a multipurpose shelf decorated with yarn ball lights. 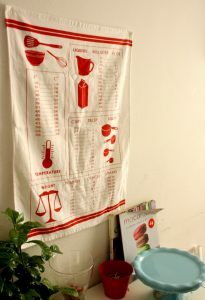 Throw in a pillow, an unused rug, an exquisite mug with your visiting cards. Most importantly, have fun and exploit your work space to its fullest. « Fresh Strawberry Scones and what my friends did to them!